Shopping for Hello Neighbor Construction Toys? Moving to a new home is hard, breaking in to the Neighbor's house and trying to find out what's behind the Basement Door is even harder. Secured by boards and nails and barricaded with chairs, getting through this door won't be easy, but the curiosity to is too much to bear. Set comes with Butcher variant Neighbor figure. The Basement Door Small Construction set features a posable, buildable Neighbor (Butcher variant) and Basement Door setting based off iconic scenery. The set contains 89 total pieces. One of the many room inside the Neighbor's creepy House, this living room might look just like any other, but looks can be deceiving. Comes with the Evil Smile variant Neighbor figure. 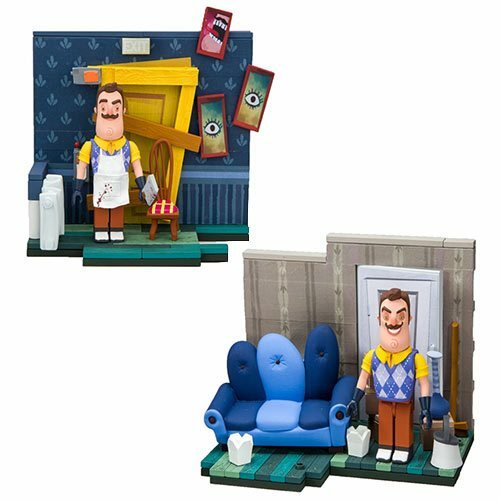 The Neighbor's Living Room small set features a posable buildable The Neighbor figure (Evil Smile variant) and Living Room setting based off iconic scenery from Hello Neighbor. The Neighbor's Living Room Small Set contains 88 pieces. Ages 12 and up. You move into a brand new suburb and notice your neighbor is hiding something in his basement. The only logical thing to do is to break into his house and figure out what he's hiding. The stealth horror game features procedural AI that is sure to give players a thrill. Hello Neighbor is a suspenseful game that has a new twist and turn around every corner. The game has been a hit with not only with players but it has emerged as a YouTuber juggernaut amassing over a billion views.